Perhaps it is the ultimate Phantom Clown story. A correspondent tonight writes: "One of the more disturbing clown events to take place this year. 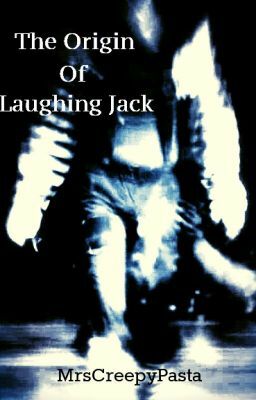 Laughing Jack, a character brewed up on the same site The Slender Man was created. 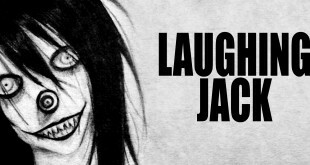 The 12 year old girl claims, Laughing Jack told her to fatally stab her stepmother to death." A 12-year-old Indiana girl who fatally stabbed her stepmother said an online horror story clown named “Laughing Jack” told her to do it, according to reports. The Elkhart girl set her family’s apartment on fire and stabbed Maria Torres “at the direction of a fictional character found on the CreepyPasta website known as 'Laughing Jack,’” according to court documents filed Tuesday and cited by WSBT-TV. The unidentified Elkhart girl “heard voices and had an 'alter ego' months before the stabbing and begged her father for help,” the court documents said. 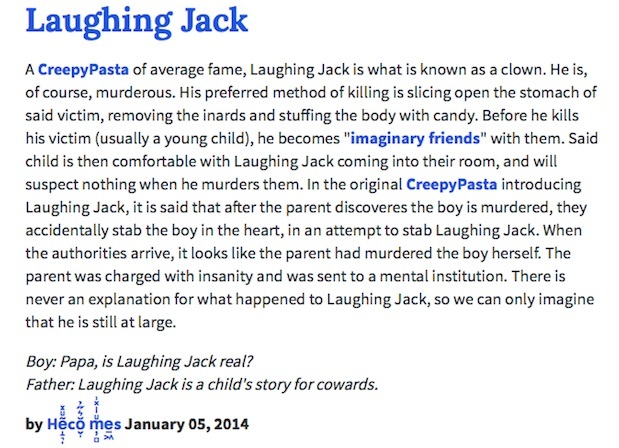 One website that posts readers’ own fictional horror stories, creepypasta.com, blocked the Daily News from accessing its site after an inquiry about the stabbings allegedly inspired by CreepyPasta characters. Another one, creepypasta.org, didn’t immediately respond to a request for comment. Doctors have diagnosed the Indiana girl as suffering from post-traumatic stress and dissociative identity disorder, formerly known as multiple personality disorder, WSBT reported. She’s been living for months in a Goshen juvenile detention center, where she’s seeing a counselor and taking medication but still pleading staff for help. She won’t stand trial unless she’s deemed fit to understand the charges against her. Her family’s main concern is getting her transferred to a state mental hospital after 16 psychiatric facilities have refused her, the girl’s lawyer, Elkhart public defender Holly Curtis, told the TV station. State officials have promised to comply with a juvenile court order to move the girl into a mental institution. “There is work being done to find the appropriate place for this young woman,” state Family and Social Services Administration spokeswoman Marni Lemons said, noting privacy concerns prohibited her from sharing more information about the case. The overlap between the CreepyPasta clown, Laughing Jack, and Slenderman is, well, creepy, especially because of the recent history of violence with both. A judge ruled in August that the two 12-year-old Wisconsin girls would charged and put on trial as adults. 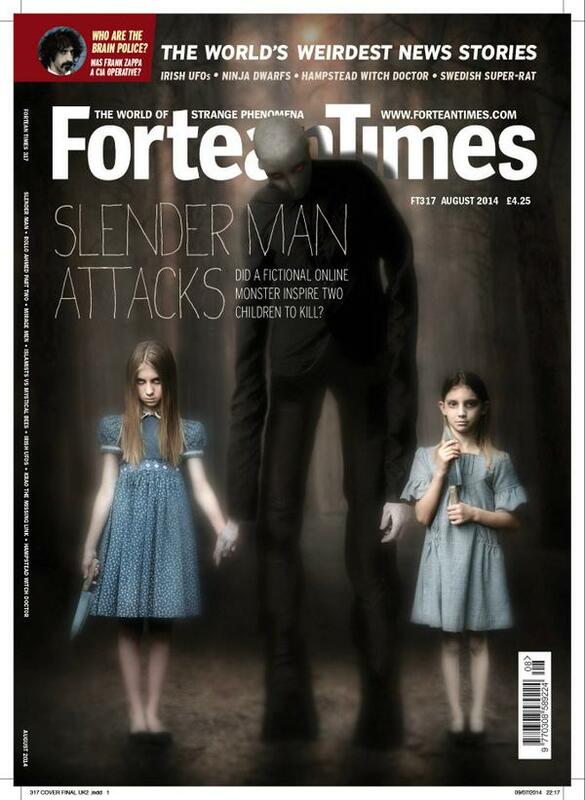 The girls said Slenderman threatened them and their families, if they didn't do his bidding. Plus Slenderman told them he would invite them into his forest castle, if they just would kill one of their classmates. Perchta is affiliated with "evil Santa" Krampus, about whom a film is being released this 4 December 2015. The Sacrifice of the Lamb and the 5s?